The question about how often to clean leather sofa is an interesting one. When you go to a furniture store in Doncaster you are quite likely to be attended to by sales person that knows just about nothing about leather. Where it comes from, how it is treated and manufactured and how to look after it. I’m not saying that there are not people out there selling quality leather sofas and furniture that actually know about leather. I’m just saying that I hope you are lucky one that finds that person. When you ask, you may get a cursory reference to some wipes that they might throw in with the deal. 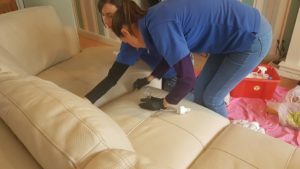 I could talk about wipes and the damage that they can cause, but this article is about how often to clean leather sofa so I will leave that for now. It is a fact that manufacturers and tanneries will tell you that a good deep clean and refinish should be carried out every six to twelve months. Depending upon the conditions in which the leather sofa or furniture is kept and how it is used. The average home owner in Doncaster may well think that once a year is about right. I would go along with this so long as the environment is ‘average’. So what is average? Well, direct sunlight is a major factor when it comes to leather being damaged. It is almost impossible to keep the sofa out of the sun all of the time in real terms. So you might want to put a throw over it while you are at work. Central heating will dry out the leather in no time. This is another big reason for having your leather sofa cleaned and treated once a year. It’s a big investment and you want it to last, not crack. So now you know how often to clean leather sofa and why. Call Doncaster leather care at anytime for a free inspection and quote. 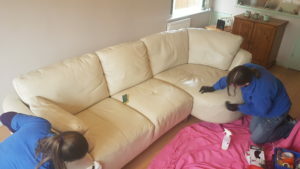 We are a local Doncaster family firm highly trained in leather care.